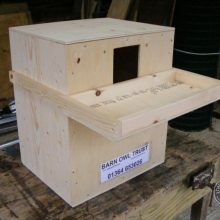 Our Little Owl Nestbox was designed by conservationist Bob Sheppard for use both inside/outside buildings and on trees. Specific to Little Owls, the exact size of the entrance hole, internal dimensions and baffle are all key to its success. ‘Built to last’ from 12 mm FSC-approved pressure treated plywood with all-weather sealant and a thick torch-on roofing felt. Dimensions (mm) 300 D x 350 W x 390 H.
More about Little Owl nestboxes. 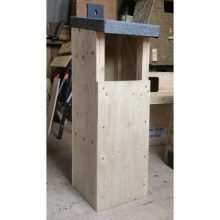 Our Little Owl nestbox was designed by owl enthusiast Bob Sheppard who has had plenty of them used by Little Owls in Lincolnshire. The exact size of the entrance hole, internal dimensions and baffle are all key to its success. Suitable for both indoor and outdoor use in/on a building or tree. 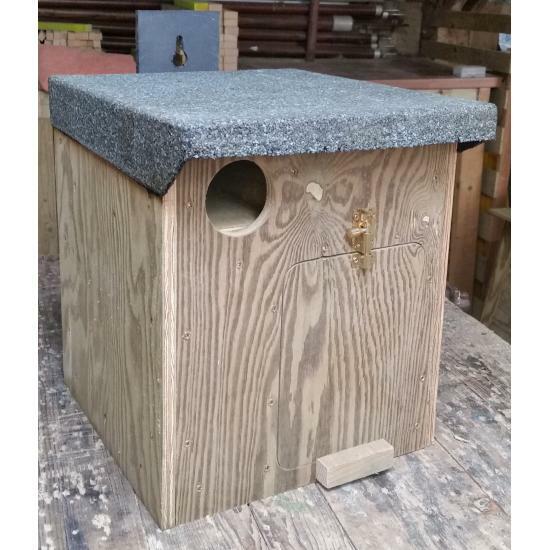 Hand made and ‘built to last’ at the Barn Owl Trust using FSC-approved pressure treated 12mm plywood with all-weather sealant and a thick torch-on roofing felt. 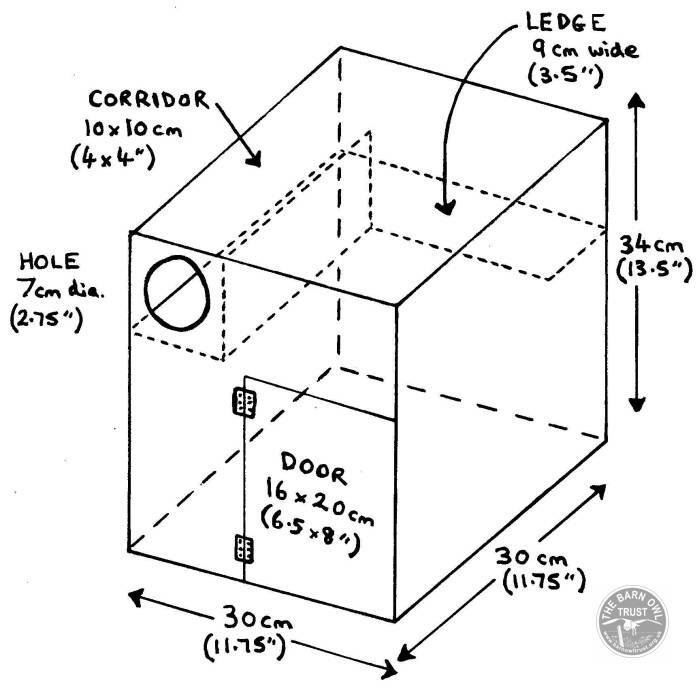 Dimensions (mm) 300 D x 350 W x 390 H. ‘Nestbox hanging kit’ included. Opening ‘inspection hatch’ allows easy access for cleaning. The owl box should be cleared out during autumn or winter, after 2 or 3 years of occupation. 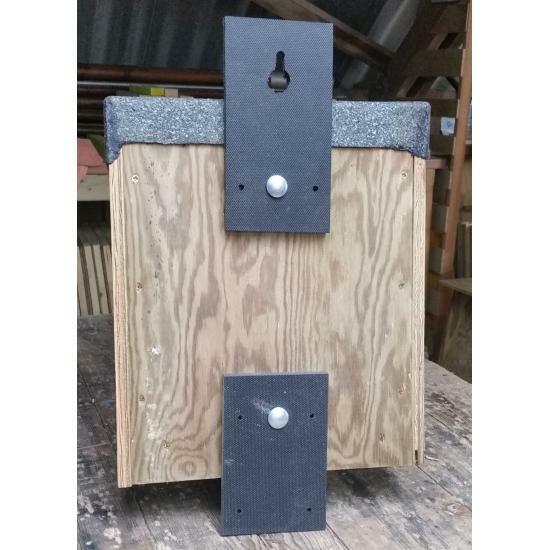 The ‘Nestbox hanging kit’ includes two hand made hangers cut from 12 mm recycled plastic Stokbord, (already fitted to the box) full instructions, screws and nails. 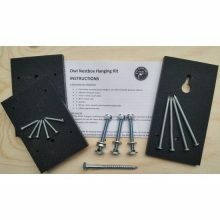 Using this kit involves screwing and nailing into a tree, wall or beam which is safer than using straps or ropes. If possible choose a dead tree. The price reflects its relatively complex construction. The Little Owl nestbox should be erected horizontally a minimum of 3 metres (10′) above the ground on a wall top, beam or tree branch so that Little Owl owlets can walk in and out prior to fledging. Little Owls seem to prefer nestboxes situated in open-sided or open fronted buildings rather than in enclosed places. A thin layer of untreated wood shavings or bark can be provided as a floor covering. 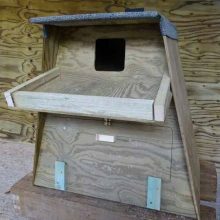 How to put up a nestbox on a tree – these photo instructions are for a (much larger) Barn Owl box – but the method is largely the same. Owl identification (including Little Owl calls). Little Owl fledgling identification and ageing. NB: Little Owls are absent from Ireland, and almost all of Scotland.